liquid ring vaccum/compressors are designedto evcuate/compress all different kind of gasesand vapours. 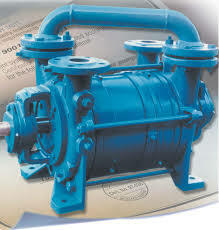 Liquid ring vaccum/compressors are commonly used in processes because of their ability to use any kind of service liquids. This feature makes the liquid ring vaccum/compressors unique for special applications where process contamination is prohibit. Liquid ring vaccum/compressors require a fliuid (preferably water) as an auxiliary or service liquid. Almost all gases and vapours can be compressed, even those containing dust and liquids.